When you’re ready to head down to Lucas Oil Stadium for game day with the Indianapolis Colts, you’ll want to make sure you’re prepared in order to best enjoy the day. Follow these tips to make game day a great day and a fun experience. You’ll find the famous Lucas Oil Stadium in the heart of Indianapolis near where the two interstates 65 and 70 meet. No matter which highway you take into the city, you’ll want to head to West Street. This road winds its way through the downtown area of the city. Due to its size and grandeur, the stadium is hard to miss once you’re on the right route. Visitors to the city have plenty of great options for accommodations. Four hotels are found right across the street from the stadium for easy access. You’ll find even more options between the Bankers Life Fieldhouse and the convention center. Skywalks are found throughout the city, so you can avoid inclement weather if you have a bit of a walk to get to the stadium. Parking is also fairly simple thanks to plenty of options and online parking maps. Depending on the game schedule, you might be looking for some food either before or after the game. There are many restaurants nearby that are perfect for sports lovers. Buffalo Wild Wings and Steak ‘n’ Shake are two easy options. The streets are full of football fans during game days, so even out-of-town visitors will feel welcome. St. Elmo’s Steak House is a local favorite and famous eatery. Here you can get an amazing meal and a top-notch experience. This is a great spot for those celebrating a special occasion. Loughmiller’s Pub is another popular place for great food in the area. Don’t miss the chance to taste their famous pork tenderloin sandwich. Just outside of the north gate at Lucas Oil Stadium, fans can enjoy the Colts pregame party. They call this event Touchdown Town, and it’s a great time for everyone with live music, cheerleaders, and games. Other attractions in the city include the NCAA Hall of Champions and the Indiana Statehouse. 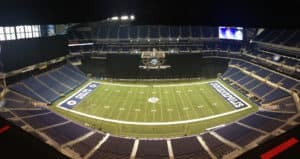 Since its opening in 2008, Lucas Oil Stadium has been the site of some great games, concerts, and even the 2011 Super Bowl. With over 140 concession stands, some permanent and some portable, there’s never a shortage of places to find food. Enjoy anything from barbeque to ice cream and much more. This stadium is very welcoming to those with additional needs. Large print menus are available throughout the stadium and every concession stand is wheelchair accessible. In fact, the entire stadium is accessible with family restrooms, designated parking, devices for assisted listening, and more. While you’re in the area for a game, find time to stop by Westgate Chrysler Jeep Dodge, just 20 minutes away. We’ll be happy to get you behind the wheel of a brand new car for a fun test drive.